An 8.9-magnitude earthquake struck off the coast of Japan on Friday, March 11. 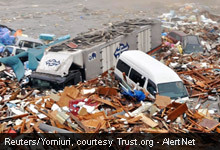 The resulting aftershocks and tsunami destroyed homes, crushed cars and killed hundreds of people. A tsunami warning has been issued to dozens of countries including: Australia, Chile, Colombia, Costa Rica, El Salvador, Fiji, Guatemala, Honduras, Indonesia, Japan, Mexico, New Zealand, Nicaragua, the Philippines and the United States. Habitat has operations in all of these places. Habitat for Humanity will assess the damage caused by the earthquake in Japan and in the countries affected by the tsunami and help as needed. To respond effectively, we need your help. Please make a donation to help Habitat serve families affected by this disaster. To make a donation and help with the rebuilding of homes destroyed by this disaster, please click here and select Japan Earthquake/Tsunami Victims as the program designation.